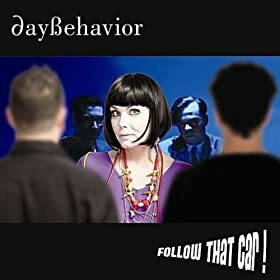 Review: Daybehavior – Follow that Car! We wrote about what a bright light Daybehavior were some time ago, but lost track and the months dragged by and their then-new songs faded from the Softsynth playlist. So when we caught wind of the at-last completed Follow That Car! we were both a little indifferent and a little interest-piqued. What was nice about rediscovering the Swedish trio is your Humble Blogger has been awash in dark, angry industrial-flavoured music these days and this album, along with the next one we are to review were like a cleansing breath of light and air. With minimal expectations we were pleasantly surprised to find an accomplished, delightful and very competent synth pop album. Much of Follow That Car! is straight forward, “no surprises here” synth pop, and when a band goes that route that tend to veer in one of two directions – they produce a collection that sounds enough like everything else we find in the subgenre that it quickly becomes pretty darn dull, or they do it well enough and with enough unique flavour that it transcends the sub genre itself. It’s a gas to be able to report Daybehavior has brought forth the latter. Sweden comes through again – they’ve produced another keeper. When it’s this good one wants it to keep on coming – let’s not wait so long between albums next time, huh folks? This entry was posted on September 29, 2012 at 11:22 pm and is filed under Review with tags Daybehavior, Follow That Car!. You can follow any responses to this entry through the RSS 2.0 feed. You can leave a response, or trackback from your own site.